This is such a neat and useful item – a heat diffuser! 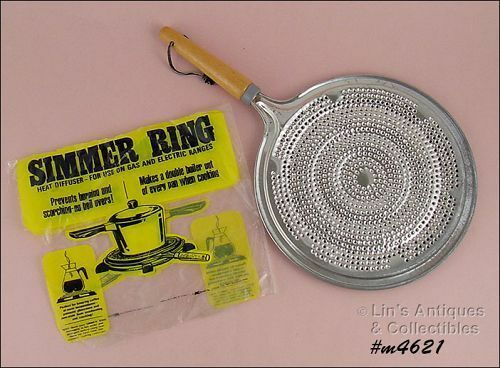 Several years ago, I purchased a box lot of Pyrex coffee pot parts and this simmer ring was in that box. The original packaging was included (see photo). What a super item to use with vintage Pyrex glass coffee pots! 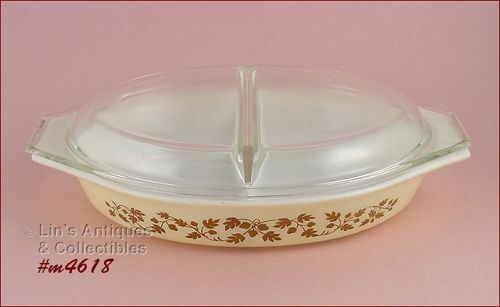 This Pyrex listing has a 1 ½ quart divided bowl and lid in the gold acorn pattern! These bowls are so neat and useful to bake or serve different items – even the lid is divided. Super condition, appears to have been used very little – I did notice a small slightly rough place on rim edge of lid that probably occurred during storage (not detrimental)! 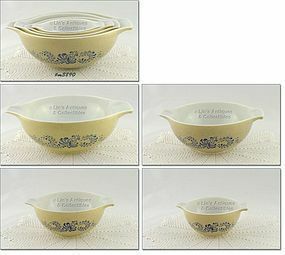 Excellent condition Pyrex small loaf pan or dish! Measures 6 5/8” x 4 ¼” x 2 5/8” and is the perfect size for meatloaf for 2 (or 1 with leftovers!). The design is on each end and because of the small area, it is an abbreviated version of the Butter Print pattern – it has 2 stalks of corn and 1 rooster. Neat item, very collectible! Excellent condition 4 cup Pyrex coffee pot! It has no chips, dings, or “use” evidence but it does not have its perk stem or basket. Excellent condition Pyrex coffee pot! This is the larger 9 cup size. Another excellent condition Pyrex coffee pot! This is the 6 cup size. Super! This Pyrex coffee pot is the larger 9 cup size and is in excellent condition! 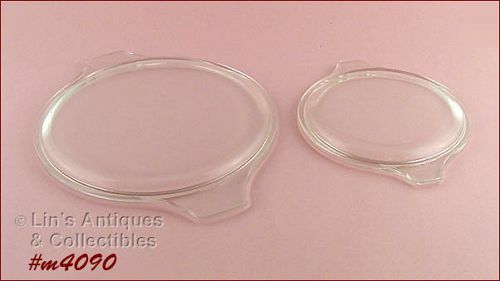 This listing has two clear glass Pyrex casserole lids! The small lid fits the 1 quart size bowl and the larger lid fits the 2 ½ quart size. This listing has an excellent condition Pyrex coffee maker! 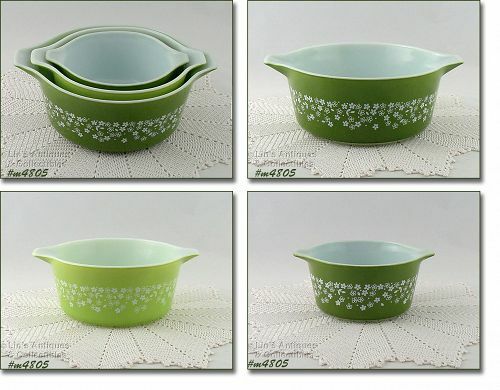 It’s the larger 9 cup size and it still has the original (and very difficult to find!) heat diffuser. Super item! 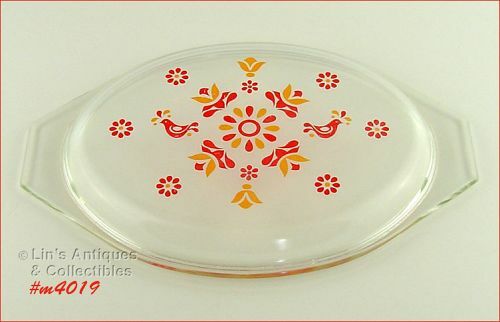 This listing has a Pyrex lid for a casserole dish from the pretty (and difficult to find) Friendship pattern! Lid measures 12 ¾” (end to end) and 8 ½” wide (at widest). One tab has “Pyrex”, the other has “945 C6”. It is in very good condition but has several “nibbles” along inner rim – they are not sharp but are there. Nice item! 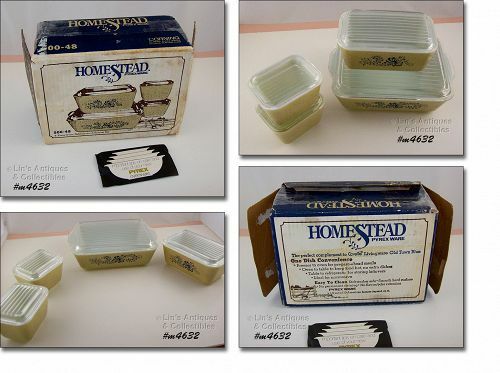 This listing has a lovely set of Pyrex nesting bowls in the Homestead pattern/design! They are the Cinderella style with pour tabs and are in wonderful condition – no chips, dings, or cracks. The largest bowl has a few minor utensil marks inside bottom and the next larger size has a couple minor scratches in the oatmeal color – nothing detrimental. Very nice set! 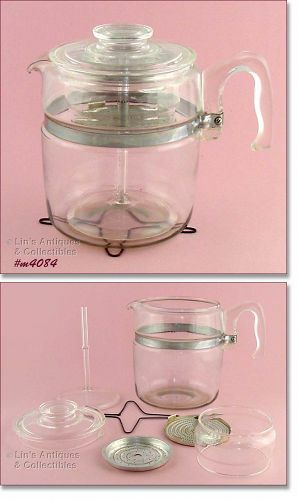 Another very nice Pyrex coffee pot! This one is the 6 cup size and is in wonderful condition with no chips, dings, or cracks. The lower part of the pot has an opaque appearance – usually occurs from being placed in a dishwasher. This is not detrimental to use or appearance. Another excellent condition Pyrex coffee pot! This is the 6 cup size. This listing has a Pyrex 4 cup coffee maker / coffee pot in excellent condition! The 4 cup size pots are difficult to find. Another super condition Pyrex glass coffee pot! This is the 6 cup size and has no chips, dings, etc. It has some light “clouding” in the bottom of the pot that I would surmise was caused by overzealous cleaning – it is not detrimental. 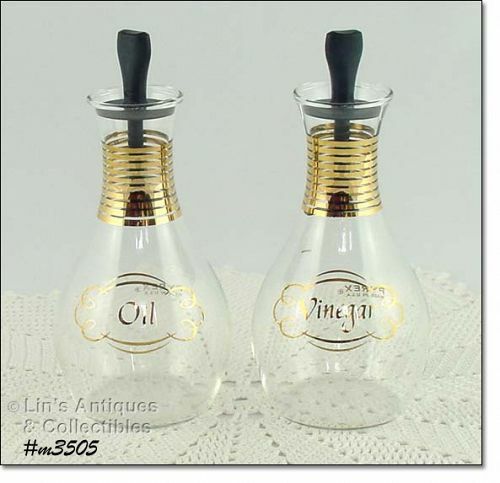 This listing has an excellent condition vinegar and oil set by Pyrex! 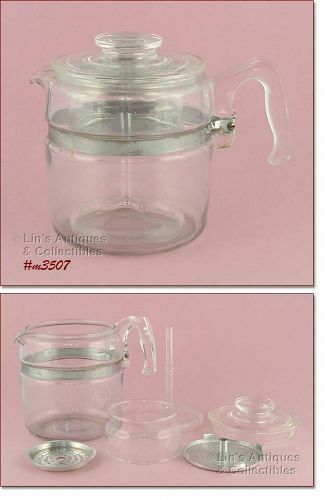 Both measure 6 ½” tall (at tallest) and have “Pyrex, Made in U.S.A.” on backs.